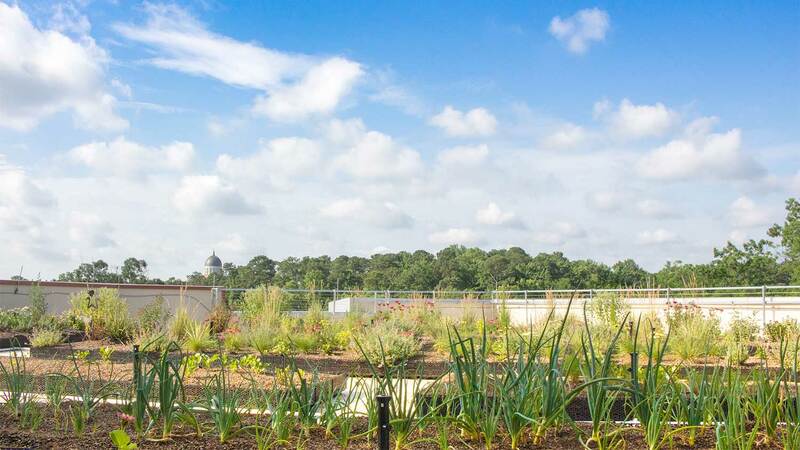 The fifth floor of Talley Student Union hosts a rooftop garden growing food for people and pollinators. 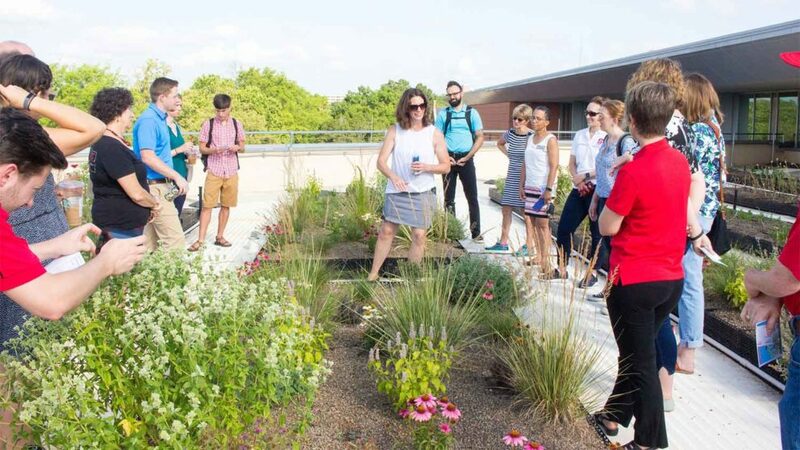 In June 2018, NC State faculty member Anne Spafford led a tour of the garden as part of the university’s Sustainability Partners program. Faculty members Anne Spafford and Danesha Seth Carley had an idea to create a green roof on another campus building. After they submitted a proposal for an NC State Sustainability Fund grant, the Fund’s leadership asked if they’d consider creating the green roof on Talley Student Union instead. Already structurally equipped to support green roofs, Talley is also the hub of student life on campus. Additionally, the new location made possible a collaboration between Horticultural Science and Campus Enterprises, which operates NC State Dining. 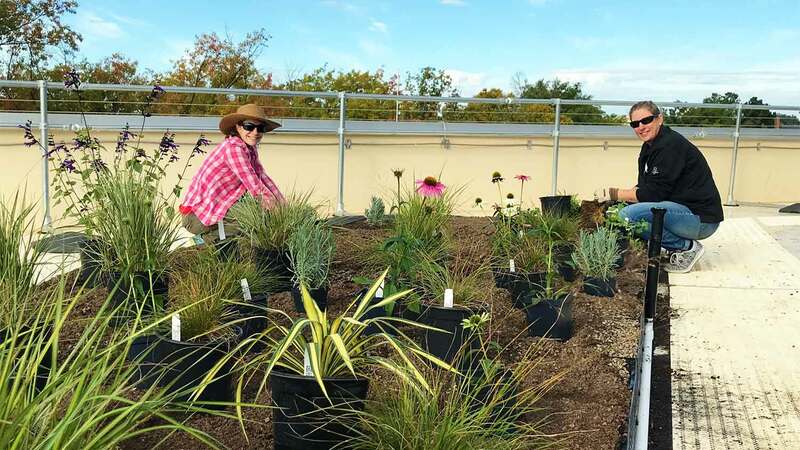 The first plants installed in fall 2017 by then graduate student Marisol Mata (left) and faculty member Danesha Seth Carley. In July 2017, irrigation and planting tray design was finalized, making way for an August installation. In September 2017, Horticultural Science students created the plant design, which they installed on October 28, 2017. 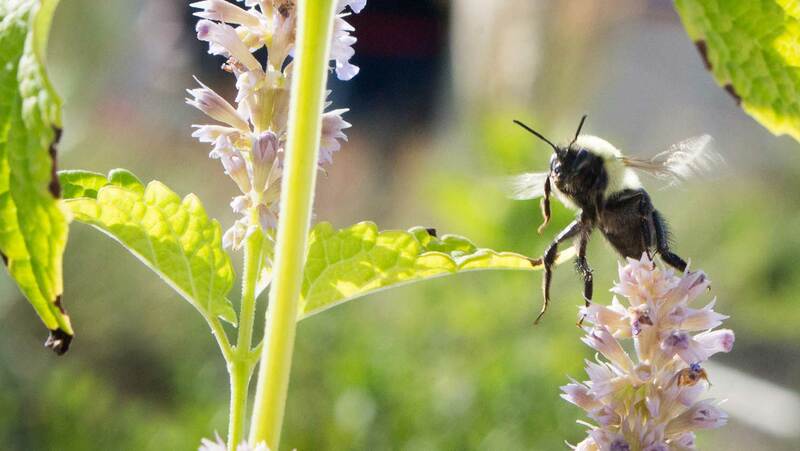 In April 2018, the second phase of plants were installed and students began collecting data, such as what type of pollinators are visiting the garden and how individual plant species are managing rooftop conditions. 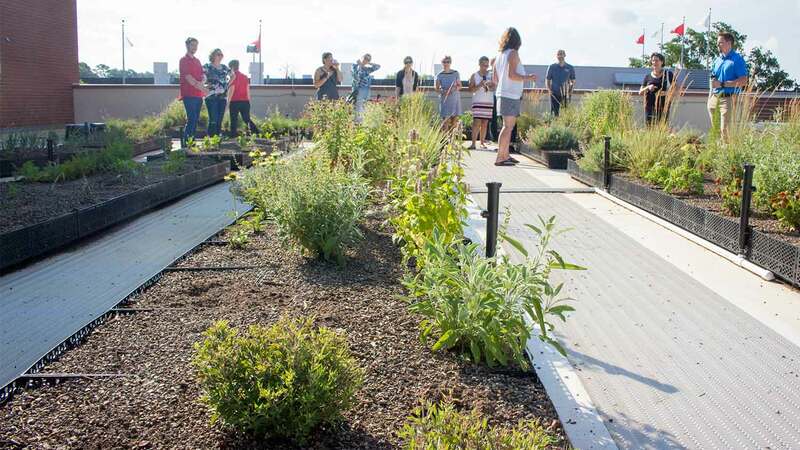 The green roof promotes green infrastructure, reduces stormwater runoff, improves air quality, supports pollinators and provides habitat for other wildlife species. Additionally, it provides a relaxing vista from the GLBT Center and Women’s Center. Students are an integral part of the project. 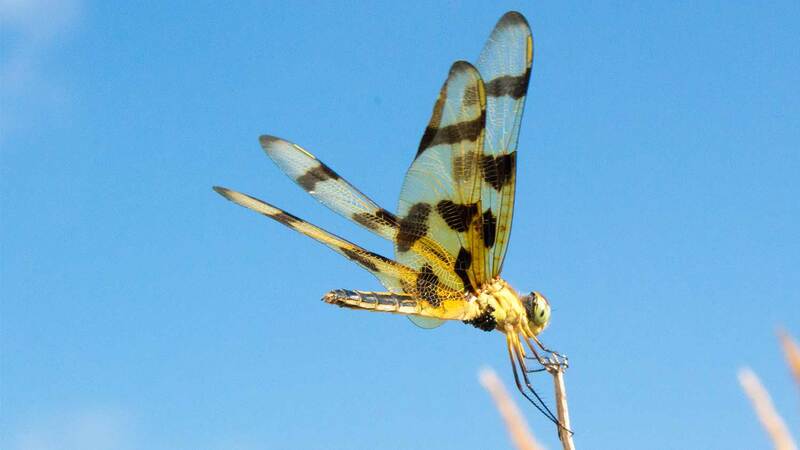 The project involves undergraduate and graduate students in the design of the garden, logistics planning, installation, garden management, research and education. For more information about the garden or getting involved with garden, reach out to Anne Spafford, Associate Professor of Landscape Design. Published in Faculty, Food, News, Uncategorized.